Jiangxi Province, China: Location, Description of World's Oldest Ceramic Pots. Oldest art of its type in the world. see: Asian Art (from 38,000 BCE onwards). Over the past 20 years, a series of exciting discoveries in the field of prehistoric art have pushed back the earliest date for the invention of pottery by more than 10,000 years. In June 2012, for instance, an article in Science magazine (June 2012), confirmed that fragments (sherds) of Chinese pottery discovered in Xianrendong Cave in China's Jiangxi Province had been radiocarbon dated to 18,000 BCE, making them the oldest ceramic art ever found. Previously the earliest art of this type had been the pottery found at Yuchanyan Cave (16,000 BCE) in China's Hunan province, the Japanese Jomon Odaiyamamoto I site (14,540 BCE), the Amur River Basin pottery (14,300 BCE) and the Vela Spila pottery (c.15,500 BCE). The team at Xianrendong included scientists from Harvard and Boston universities who also examined ceramic fragments from Yuchanyan in 2009. Pottery has been a traditional Chinese art for millennia, but the Xianrendong Cave sherds establish beyond any doubt that pottery appeared long before Stone Age humans took up farming and animal husbandry. Indeed, we know that forms of ancient pottery were made almost continuously in south China from 18,000 BCE onwards, even though the era of Neolithic art - the cultural period usually associated with the creation of domestic artifacts like pots - did not commence for another ten thousand years. Even in southern Europe, where Greek pottery didn't appear until around 7,000 BCE, humans had been making clay-fired objects for millennia - see, for example, the Venus of Dolni Vestonice (24,000 BCE) unearthed at a Gravettian settlement south of Brno, in the Czech Republic. To see how Xianrendong pottery fits into the evolution of Stone Age art as well as various forms of cave art, across the world, please see: Prehistoric Art Timeline (from 2.5 million BCE). For the history of Stone Age cultures in East Asia, see Chinese Art Timeline (18,000 BCE - now). Almost all of the oldest pottery has been discovered in south China (notably around and to the south of the Yangzi/Yangtze River basin), although early ceramics have also been found in the Yellow River basin, and at more distant locations in East Asia, such as Japan and Russia (Amur River basin). At present there is no consensus among archeologists and anthropologists as to why pottery was invented in China, as early as 18,000 BCE, although some believe it happened because of climate. Back in 18,000 BCE, when the Last Glacial Maximum was at its height, the Earth was experiencing the coldest climatic conditions for more than a million years. Plant and animal food would not have been easy to come by, and the production of clay-fired pots as cooking devices would have allowed people to extract the maximum nutritional goodness from their food by cooking it. Cooking food is one of the best ways of boosting nutritional intake from starchy plants and meat. In any event, archeological evidence shows that news of this ancient art spread rapidly within East Asia. According to Dr Zhijun Zhao, an archaeologist at the Chinese Academy of Social Sciences in Beijing, Chinese hunter-gatherers may have established seasonal camps, specifically to make pots. For more about Asian culture, see: Japanese Art (from 7500 BCE) and Korean Art (from 3,000 BCE). For the oldest cave painting in Asia, see: Sulawesi Cave art (Indonesia) (c.37,900 BCE). Xianrendong Cave (known as "Immortal's Cave" in Chinese) is located at the foot of Xiaohe mountain, in Wannian County, in northeastern Jiangxi, in southeast China. The province of Jiangxi stretches from the Yangzi River in the north to Fujian in the east, Guangdong in the south, and Hunan to the west. The interior of Xianrendong Cave measures 7 metres (23 feet) in height, 11 metres (36 feet) in width, and 14 metres (46 feet) in depth. It contains a small entrance and a large inner chamber. Located about 800 metres (half a mile) away from Xianrendong (and about 200 feet higher), is the rock shelter of Diaotonguan. This contains the same cultural stratigraphy as Xianrendong and may have been used as a habitation site by Xianrendong's potters. Xianrendong Cave was first excavated in 1961 and 1964 by the Jiangxi Provincial Committee for Prehistoric Culture, under the direction of Li Yanxian. A later series of excavations were carried out in 1995-1996, by a Sino-American team led by R.S. MacNeish, Shifan Peng and Wenhua Chen; and in 1999-2000, by scientists from Beijing University and the Jiangxi Institute of Cultural Relics. Finally, in 2009, an international team of scientists collected 45 samples of bone and charcoal from previously excavated layers of cave floor sediment. Radiocarbon measurements were obtained by tests conducted in three labs - one in China and two in the USA  indicating the presence of humans at Xianrendong from about 27,000 to 15,500 BCE. Actually to begin with, the archeological layout at Xianrendong appeared quite unpromising. Four cultural strata were identified. The oldest was dated to the period 17,000-9,000 BCE, connecting the periods of Paleolithic art and Mesolithic art. The others were dated to the Neolithic period, the youngest around 6,000 BCE. As a result, the oldest pottery was originally dated to 14,700 BCE, before new laboratory results produced a series of AMS radiocarbon dates, ranging from 17,000-18,000 BCE, making it the world's oldest known pottery. For the earliest crafts, see: Oldest Stone Age Art: Top 100 Artworks. 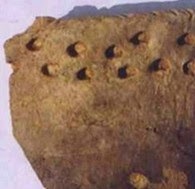 Similar to the ceramic vessels found at Yuchanyan in Hunan province, the sherds discovered at the Paleolithic hunter-gatherer cave site of Xianrendong were the remains of coarse-pasted, round-bottomed, bag-shaped jars with plain or primitively decorated walls. 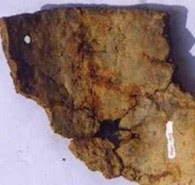 Made from clay, with added sand, quartz and feldspar, they were used for boiling, baking and steaming food, rather than storage, as is evident from the burn marks and soot on their outside surfaces, caused by being placed over fires. The archeological layer in which the ceramic fragments were found, also contained a large quantity of clam and snail shells, clearly indicating the popular Chinese food of the time. Xianrendong's pottery is reminiscent of early Japanese Jomon pottery about 14,500 BCE. It consists of crudely made, poorly fired bowls and pots, roughly 20 centimetres (8 inches) in diameter, and prone to breakage. The surviving sherds have thick but uneven walls, with round bases and rough surfaces. The texture of the paste is brittle and loose, and has a variable reddish/brown colour from uneven firing. Some of the outer surfaces have cord and/or basket-like impressions left behind from the wrapping of strictures around the clay body to create artistic patterns, prior to firing. The ceramic pots were made using two different methods: sheet laminating or coil techniques. To see how the Xianrendong pots fit into the evolution of ceramics, see: Pottery Timeline (26,000 BCE - 1900).  For more about Paleolithic pottery in China, see: Homepage.